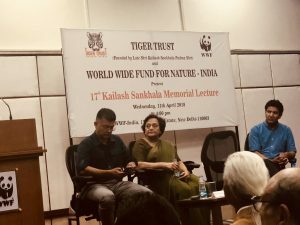 The 17th Kailash Sankhala Memorial Lecture organised by Tiger Trust in collaboration with World Wide Fund for Nature – India, raised awareness about the world of snow leopards. Organised in memory of the Tiger Man of India, the esteemed gathering was addressed by Dr Koustubh Sharma, Senior Regional Ecologist, Snow Leopard Trust; Dr Tsewang Namgail, Director, Snow Leopard Conservancy India trust and Ravi Singh, CEO, WWF. Anjana Gosain, Chief Functionary Officer, Tiger Trust, helped put together yet another insightful lecture while trustee Amit Sankhala added some food for thought. Tiger Trust was founded by Padmashri Late Shri Kailash Sankhala, in 1989 to protect endangered tigers in their natural habitat. The Trust functions in a three-way approach, namely capacity building programmes, awareness campaigns and working with the ground staff.